JAXA | Venus Climate Orbiter "PLANET-C" Nicknamed "AKATSUKI"
Home > Press Release > Venus Climate Orbiter "PLANET-C" Nicknamed "AKATSUKI"
Venus Climate Orbiter "PLANET-C" Nicknamed "AKATSUKI"
The Japan Aerospace Exploration Agency (JAXA) is scheduled to launch the Venus Climate Orbiter "PLANET-C" in Japan Fiscal Year 2010. JAXA has decided the nickname of the PLANET-C as follows. The name was discussed and decided by the PLANET-C project team. "AKATSUKI" means "dawn" when Venus shines most brightly as the first graying of dawn appears in the east sky just prior to sunrise. The AKATSUKI is scheduled to arrive at Venus, which beautifully shines as the "morning bright star" at dawn, in the winter of 2010. The name also reflects the purpose of the PLANET-C project to newly create planetary meteorology by exploring Venus. The word "AKATSUKI", which indicates the start of a day, implies not only a beautiful scenic image, but also the power of achieving a goal, thus the name carries the thoughts and determination toward the success of the mission. By publishing the nickname well in advance of its launch, we intend to make people more familiar with the satellite and its launch preparations, actual launch, and on-orbit operations. Venus is a similar planet to earth and rotates around the Sun, but Venus’s rotation orbit is a bit closer to the Sun than that of the Earth. Venus is believed to have been formed in a similar process to the Earth’s formation about 4.6 billion years ago, hence the two planets are thought to be like twins. However, the environment on Venus is quite different from that of Earth. There are no oceans there, and its atmosphere consists of heavy carbon dioxide that causes the greenhouse effect to make Venus a tropical heat world of 460 degrees Celsius. Up above Venus, clouds of sulfuric acid are swiftly flowing at a speed of 400 km per hour. 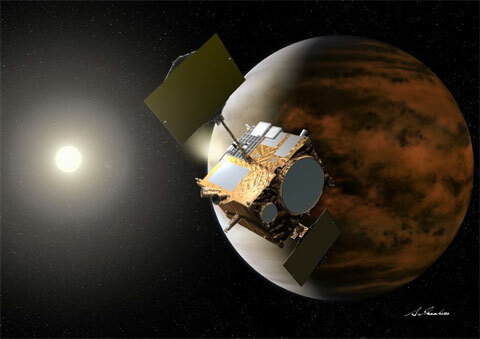 The Venus Climate Orbiter "AKATSUKI" (PLANET-C) is the world’s first planetary meteorological observation satellite to unveil the mysteries of wind on Venus. It will explore the mechanism of the Venus climate by observing the atmospheric movement and cloud formation process. Ultimately, this mission aims to deepen our understanding of the formation process of the Earth’s environment and its future by comparing Venus and the Earth. For more details about the AKATSUKI, please check the following site.